Forecastle pulled off booking multiple heavy hitters again. They grabbed acts that work well with the setting of the festival and in the south, with a mix of rock, folk, country and blues. Outkast even showed up to pollute the lineup joining other headliners Jack White and Beck. White and Beck. Let's breakdown some of the lineup. With Jack White starting to pick up multiple festival bookings over the last two months, including Bonnaroo and Governors Ball, it was a pleasant surprise to see him on this bill. 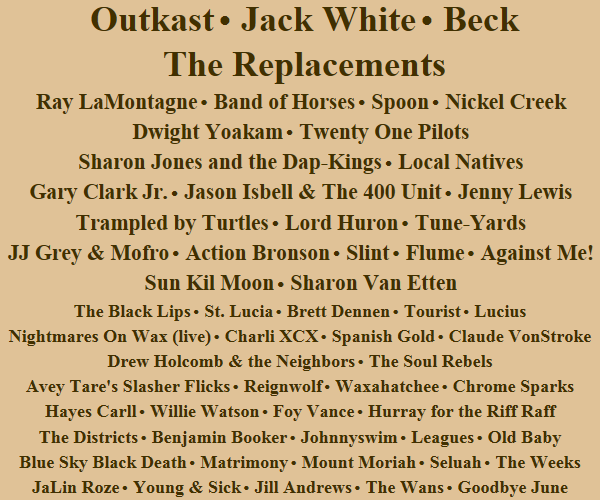 Jack fits Forecastle more than any other festival in the south besides maybe SXSW. His gritty presence and hard riffs fit nicely into this southern influenced lineup. Plus, this is another opportunity for me to see him as Louisville is only five hours from Cleveland. I'm sure I'll have many other opportunities as he'll be touring heavily it appears for his expected upcoming album. Although I love Beck, I'm not sure how he fits in here or any festival this season to be honest. His latest album doesn't necessarily have any festival driven tunes and has a bit of a slower pace. Again, I love Morning Phase (click here see my review of the album), but I just don't see it in this setting. He'll be performing at Pitchfork this same weekend in Chicago and I can actually see him fit better with the hipsters there. As long as he hits the Midnite Vultures and Odelay classics, I'm sure he'll be a knockout at both. This was a nice get. JJ's bluesy voice and southern style make him another perfect fit at Forecastle. I'm pretty pumped to see him here as the only time I've seen him before was two years ago at Lollapalooza when his show got cut early and only played three songs. Louisville will love his southern authenticity. Hopefully he gets into a staring contest with a glass of water again. If you don't know what I'm talking about, you'll have to catch him live. Pumped to see him after missing most of his set two weeks ago in Columbus and last night here in Cleveland because I saw WWJP instead. Tons of great blues rock tracks from GCJR, but hopefully he leaves his DeAngelo-esque R&B tunes at home. Another great fit. He'll most likely be a day act on a smaller stage, but he can carry a note and a crowd. A bit of an odd dude. I met him at the World's Largest Block Party two years ago and he growled at me. He gets a pass though because he has made three solid albums in a row. I love these dudes and they're from Louisville, so this makes sense. Being produced by the Kings of Leon, these guys know how to hit notes over dude rock. I haven't seen them before live, but if they also learned how to own a concert, I'm sure we're for a show. I'm interested in seeing them since Thomas James Gabel became Laura Jane Grace. I haven't heard much of the new album, but these guys/gal are more of a punk act. Still, I loved their old stuff, so looking forward to seeing it live. My friends and wife would tell you I have a bit of a crush on Jenny Lewis. What they tell you is true.